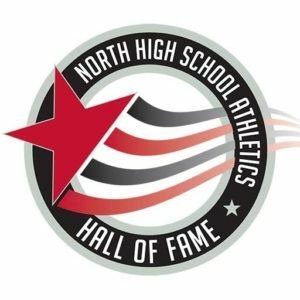 Lori will probably go down as one of the greatest softball pitchers in North High’s history but she was also an outstanding volleyball and basketball player. Playing varsity in all sports throughout her high school career, her size played a big part of that. Not one to brag about her accomplishments, she was first team all-SYL in softball in both her junior and senior seasons. She gives a lot of credit to her coach, Karen Wass. In volleyball, playing for Coach Judy McDole, she was voted “Most Inspirational.” She missed her entire junior year in volleyball and suffering a severely sprained ankle when she landed on the foot of teammate Jill Turner in practice. a baseball player at Cal, offering to catch her practicing pitching and being shocked at how well he handled her. decision since she was able to be a part of the 1982 Lady Bruins team that won the National Championship. of Arizona and losing 1-0 on an error. She outlasted three U of A pitchers but suffered a heart breaking loss. She said she had trouble moving the next day. You think? She was named MVP of other tournaments but claimed her greatest accomplishment was marrying Craig Schoene who was himself a heavyweight wrestling medalist at the Pan Am Games. Craig also coached wrestling at North High in 1983. They proudly have three children, Brian, Amanda and Daniel. All turned out to be terrific athletes. Brian wrestled at BHS at 215#, earning 3rd in the State meet. A back injury ended his career after offers from Stanford and CSUB. Amanda was a standout volleyball player at BHS, and then attended a JC in Nebraska for two years before returning home to CSUB. She also played both volleyball and sand/beach volleyball for the Lady Roadrunners. Daniel, the baby (?) of the family stands 6’6” and 310 lbs and was an outstanding tackle for the Drillers the past three seasons. Also a wrestler and track and field athlete, he’s headed to UNLV next year on a scholarship.